The incident took place in Selkirk's Market Place yesterday. 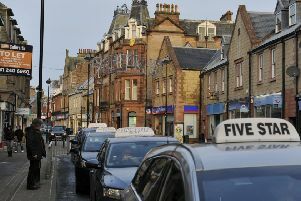 A 27-year-old man has made a private court appearance in connection with a machete attack on a man and a woman in Selkirk town centre yesterday. Harrison Long is charged with assault to severe injury following the incident in Market Place at around 11am on Sunday, February 3. His alleged victim, aged 41, suffered a serious arm injury during the incident and was taken to Borders General Hospital for treatment. Long also faces charges of assaulting a female with a machete and possession of offensive weapons – namely a machete and a metal pole. Thereafter, he is charged with threatening or abusive behaviour towards officers at Hawick Police Station and vandalism of a cell. Long, who gave an address in Innerleithen, is also accused of assaulting a female and cruelty to a dog in Selkirk the previous day. He made no plea to a total of eight charges during a private hearing at Jedburgh Sheriff Court. Long had his case continued for further examination and was remanded in custody by Sheriff Peter Paterson. Police Scotland said a second man, aged 41, was arrested in connection with possession of an offensive weapon after police officers were called to an address in the Ettrick Road area of Selkirk at around 12.25am on Monday.